Socio-economic factors can affect health in surprising ways. For example: A doctor prescribes insulin for a diabetic patient, but doesn’t ask if the patient has a refrigerator in which to store it. The patient lives in a neighborhood with substandard housing conditions, and a working refrigerator or electricity isn’t a given. The insulin spoils and doesn’t control the patient’s blood sugar. A new map of neighborhood disadvantage may help better address that kind of problem while boosting research into the social factors that shape health. 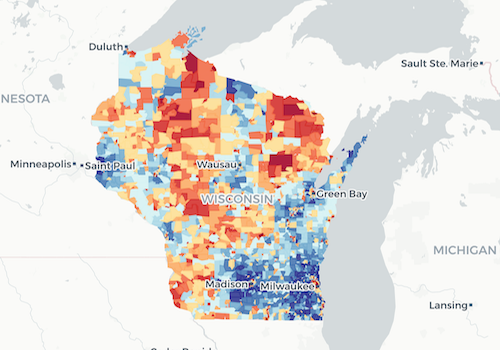 Researchers at the University of Wisconsin School of Medicine and Public Health have developed an accessible, online, interactive map of more than 70 million Zip+4 zip codes so that users can find data on socio-economic factors at the neighborhood level. The Neighborhood Atlas helps quantify the degree of disadvantage in a given area – a factor increasingly viewed as critical to assessing health disparities and effective interventions. An article about the neighborhood atlas was published today in the New England Journal of Medicine. Amy Kind, MD, PhD, associate professor of medicine (geriatrics) at the University of Wisconsin School of Medicine and Pubic Health, and health geographer William Buckingham of the UW Applied Population Laboratory led the study. Red areas on the map have more disadvantages and blue areas have fewer. The map is based on the Area Deprivation Index (ADI), a measure created by the Health Resources and Services Administration many years ago for use on larger geographic areas and based on census data. Kind’s research group has modernized and refined the ADI down to the neighborhood level for all of the neighborhoods within the United States and Puerto Rico. Furthermore, they have constructed an interactive map and made the information easily accessible to all users and mergeable into many other data resources. The ADI includes four areas: unemployment, poverty, education and housing and includes multiple measures of each area to yield a picture of a given area’s socio-economic disadvantage. There is a map for each state and Puerto Rico. One can rank a given state on its own metrics or compared with the national average. Kind says the data housed by the Neighborhood Atlas is already being used by state and federal agencies and health systems; for example, a national diabetes disparities program run by U.S. Centers for Medicare and Medicaid Services is using Neighborhood Atlas ADI data to inform ground-level operations so the program can be targeted to areas that will most benefit from it. The atlas has many additional possible uses for research, such as enabling more targeted clinical trials and drug therapies, study design and recruitment and dissemination of research findings. On the clinical side, physicians could use it to understand more about their patients’ living environment and health systems could use the data to alert clinicians about neighborhood factors that could affect medical progress once the patient leaves the hospital or clinic, so that appropriate support can be included in their care plan. Kind’s team plans to update this map every five years. The work was funded by National Institute on Minority Health and Health Disparities of the National Institutes of Health under Award Number R01MD010243 and the National Institute on Aging of the National Institutes of Health under Award Number RF1AG057784. This story first appeared on the UW School of Medicine and Public Health website.